Our experiment requires the use of both string input (short sentences) and single key input (numbers 1-5). How do we go about telling the program which event uses which input type? 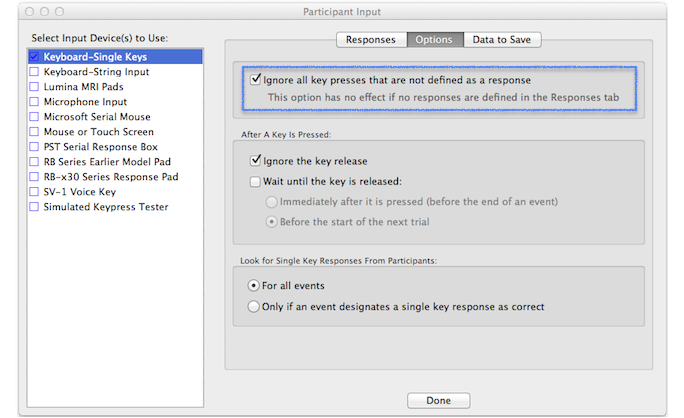 In the Participant Input dialog, for Keyboard-Single Keys, click on the Options tab and select the last option at the bottom, Only if an event designates a single key response as correct. In the Event Editor, make sure that you always have a correct response. The one that you select will tell SuperLab which method to use: single key or string input. Ok so now we have a new problem. We have the key response types correctly formatted. However, for the single key responses, a participant could still press any key; we want responses to be keys 1-7, and nothing else. Is there a way that we can tell SuperLab to ignore all other keys but accept only responses 1-7? There is a way to do it, although it is not 100% optimal. Click on your event where participants respond, go to correct input, and then edit the possible responses. Under single input, create as many new responses as the number of keys that your participant chooses from. For example, for response 'ONE' is linked to pressing the number 1. Do this for all the numbers. Then go back to the Correct responses tab, and tick all the numbers that participants are allowed to press; go to Input, and make sure that you only move from this trial when a correct response is given by the participant. In summary: all allowable keypresses are 'coded' as single input responses, and all are coded as correct for that trial. The trial will only move forward if a correct response is given. Of course, the biggest problem with this is that ALL the keypress are coded as correct. So if the c orrect response was actually 5, but your participant pressed 2, Superlab will still see that as correct, because of the above setting. Unfortunately, this is the only way that we managed to get around this issue, however it is hardly optimal. This is now possible with our new release of SuperLab 5. Below is an image that shows how this is implemented within the Participant Input editor.